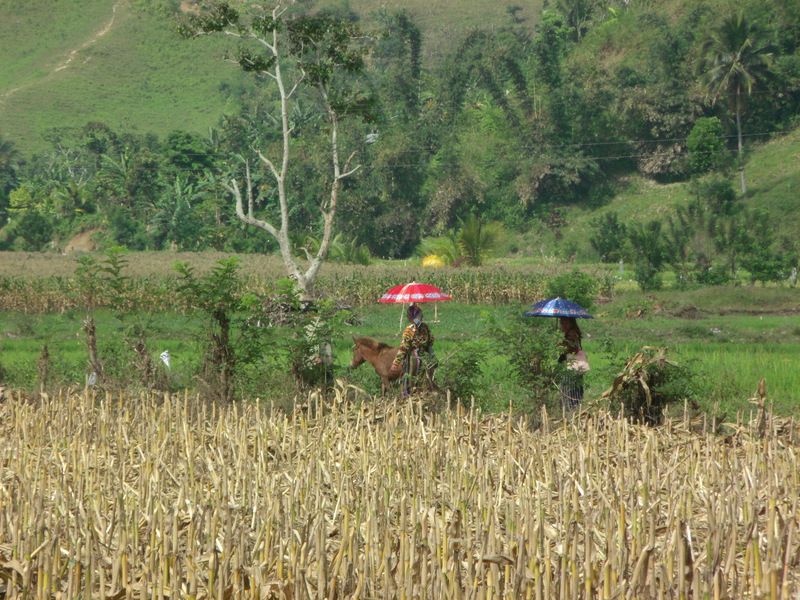 I had come to Lake Sebu not to seek out the lake but the people whose home it is. 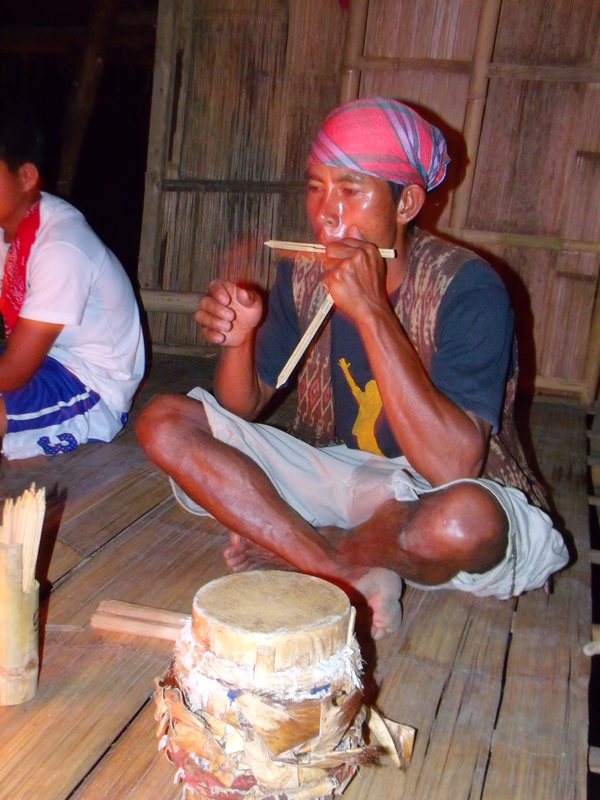 I have been fascinated with the T’boli since I was in high-school and saw a documentary on the T’boli made by the Sta. Cruz Mission. Resplendent in their traditional garb of handwoven textiles and colorful plastic beads and brass bangles, they caught my imagination. Their dances using the tubular cloth which hang from their necks as they whirled feverishly around in circles while their feet lightly tapped the ground was amazing. Their lute, the hegalong, had also taken on iconic status for me. I knew that one day I would make this trip. It did take decades before I finally set foot in the ancestral domain of the T’boli. Progress has inevitably altered their lives and lifestyle and outside the tourist industry, finding their culture was quite difficult. I was really lucky to have met Oyog. She not only got me the instruments I needed but more importantly, she allowed me to set foot to glimpse their world of dance and music. Returning from the trip to the falls and the T’boli Museum, Oyog had dropped me at the Green Box to rest while she went to a village to seek out Joel. 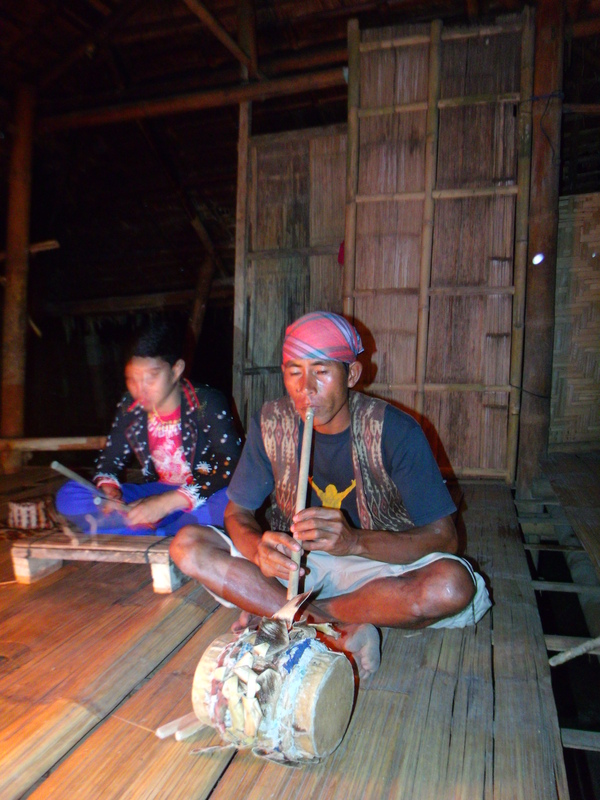 She assured me that he was one of the best musicians and he could make me a dwegey, a sloli, and a t’nonggong. About an hour later, she returned to tell me that she had gone to him in the fields where he was working on a ploughing machine and that he would come in the evening to make me the instruments and to play! I was really excited about it as I have never seen a “living” example of a dwegey before. She also assured me that in the evening there would be dancing. The moto driver would fetch Joel at around 4. I had more than ample time to go back to Kehelingan as I was interested in the t’nonggong I had seen the previous day. The doors were closed to the main shop but someone in the restaurant called a plumped middle-aged lady that could pass-off as anyone’s gracious mother. She opened the doors and we went in. She was Nida Bacalang who was head of the foundation which was an umbrella organization of different craft-making associations. She was very patient and answered all my questions and even let me try the different blouses and vests on display. They were really beautiful and could cost up to Php 7,000 depending on the intricacy of the designs and the beadwork. One of the simplest ones cost Php 800. I tried on a big one and it fit me though it hang half-way up my torso. If it had been long enough, I would have bought it even if it was a woman’s blouse. A complete T’boli outfit consisting of a blouse, skirt, and all the accessories including head gear costs Php 7,000! I bought one of the sludoy on display for Php 250. I could have gladly bought the bigger and heavier one which was only Php 100 more but I didn’t think I’d have space for it. The instruments looked like the real thing and didn’t seem to have been made for the tourist market which most of the souvenir shops had. I couldn’t help taking my eyes off the red square fabric hanging on the wall. It was a head gear worn by T’boli women minus the frame. 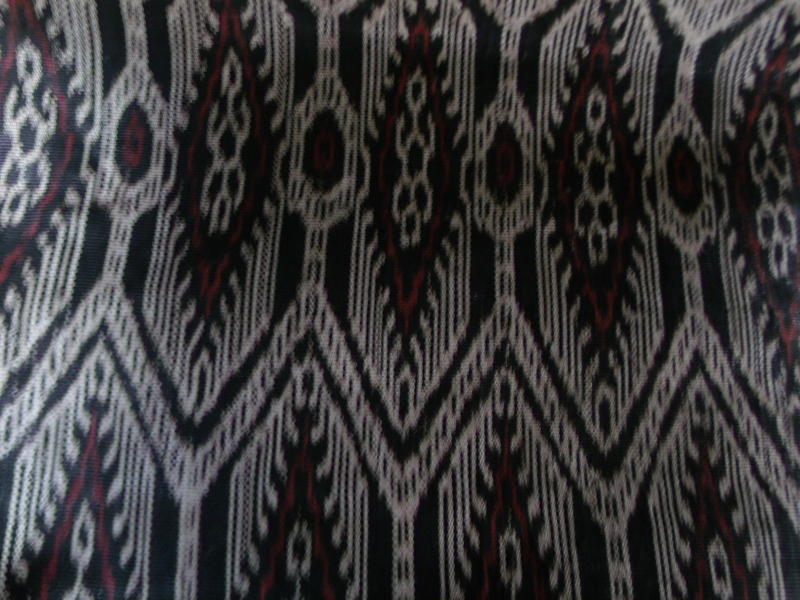 The fabric alone cost Php 500. Attached to the frame so it could be worn properly on the head, it cost Php 800. With beads hanging down from the edges, it costs Php 1,000. She got one hanging from the restaurant and showed it to me. I manage to persuade her to give it to me for Php 500 as it was quit dirty having been on display outside the restaurant’s dining area. I spent the rest of the afternoon packing my stuff as I was leaving the next day. The instruments would have to be packed the next morning as they needed more time to dry out under the heat of the sun. The moto driver came knocking on my door past at around 5 to say that Joel had arrived! 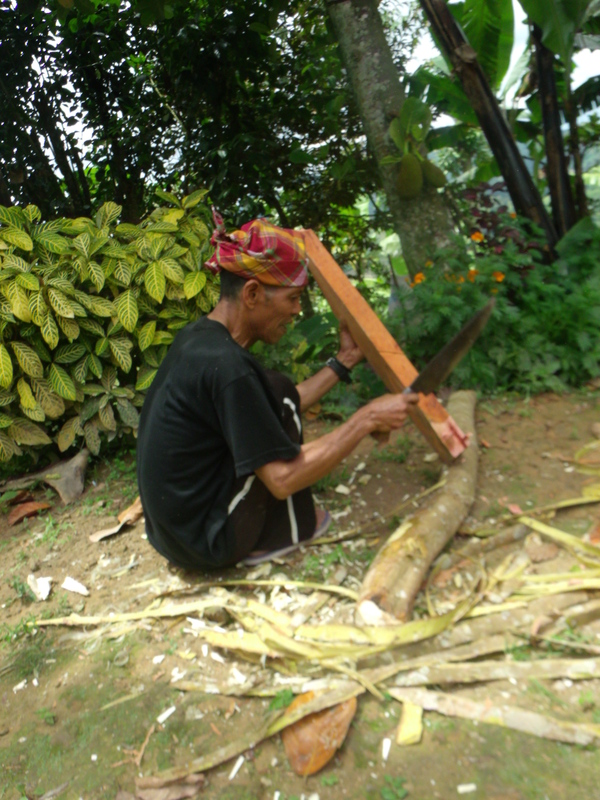 I quickly shuffled to Oyog’s house and there he was, cutting the bamboo to be used for the dwegey while his teen-aged son was removing the meat from the coconut which was to be used as resonator. 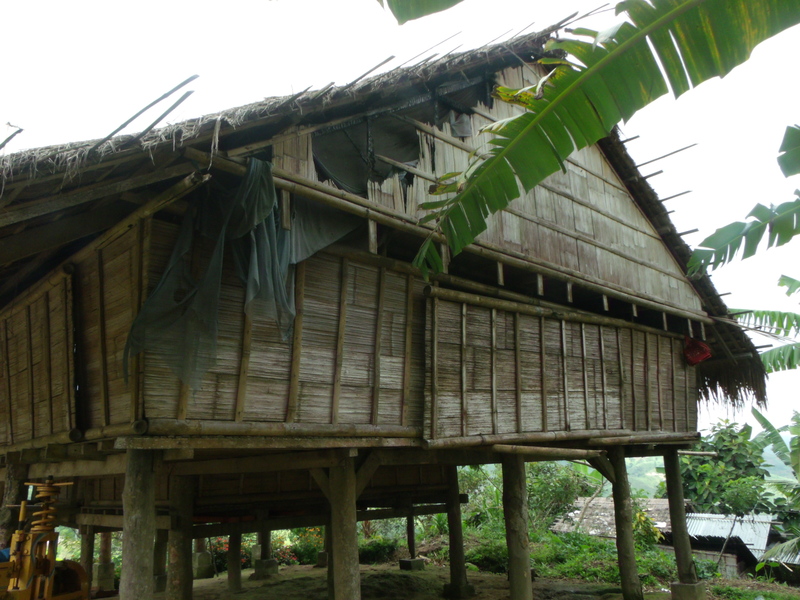 It was dusk and there wasn’t any light on Oyog’s tribal house. I had to make do with the flashlight on my Blackberry just so I could continue documenting his crafting of the instrument and also of that of the sloli. 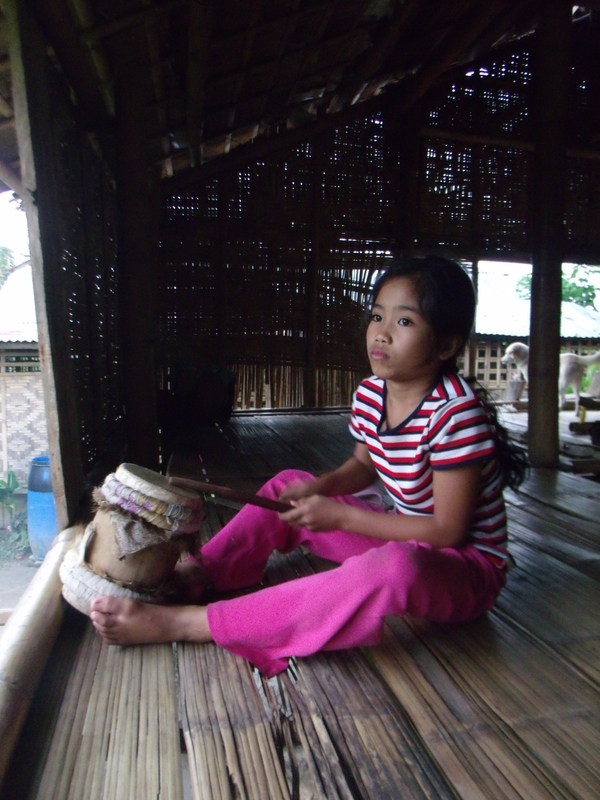 Upstairs, Oyog’s youngest daughter was practicing on the t’nonggong. With her younger cousin, a cute little boy, they practiced the warrior dance while another girl beat out some rhythms on the drum. It was fascinating and really fun to watch them as they were really intent on their dancing and playing. I was really taken-in by Oyog’s daughter and her natural love for the arts. 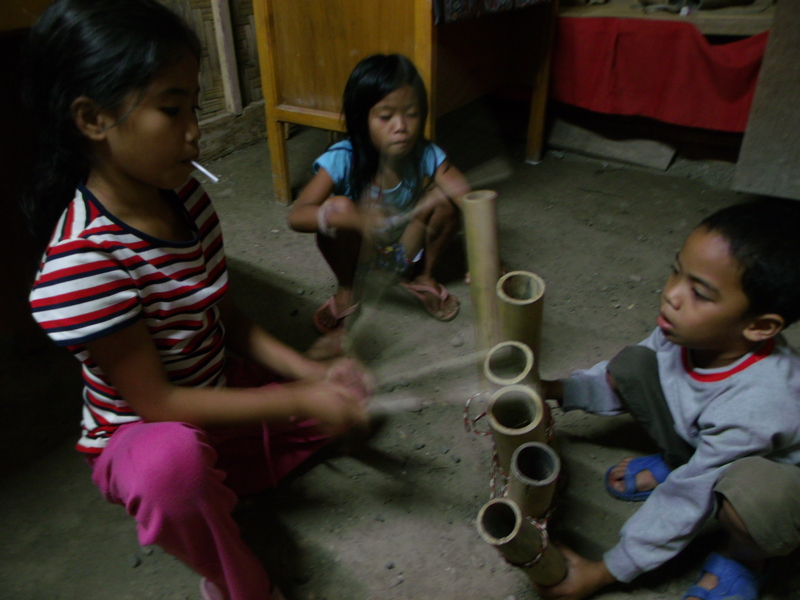 After retrieving my flashlight from my room, I chanced upon her practicing on the bamboo tubes which her cousin held upright. She was continuously exhorting the others to play and play and play. 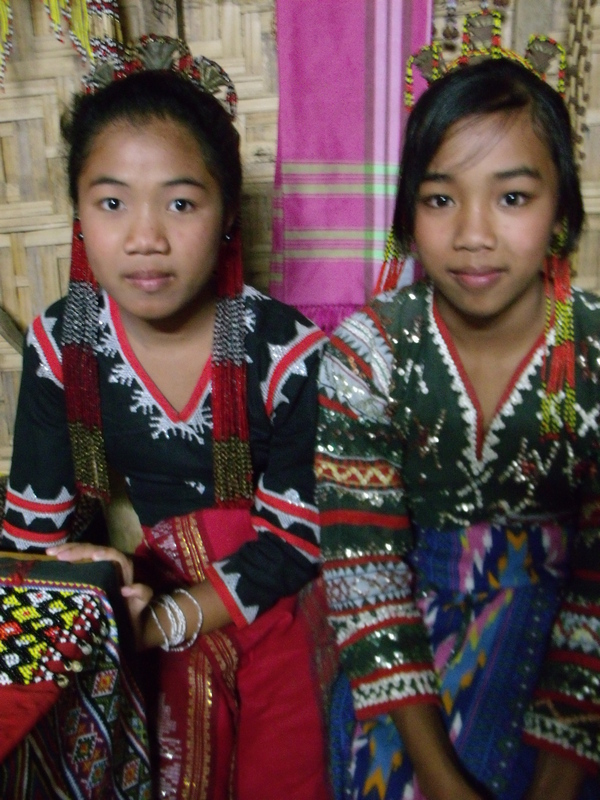 Night had fallen and a couple of young girls, students of Oyog, had arrived in T’boli garb. They were fully made up and looked so pretty. Oyog had told me earlier that there would be dancing and they would be in their traditional wear. Seeing the young girls, I knew the evening would be really special. 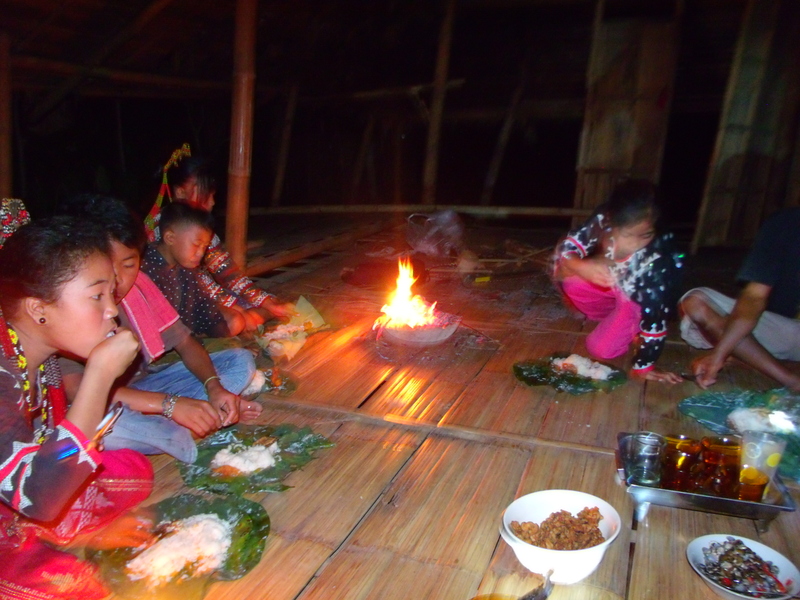 A bonfire had been built in the center of the tribal house. By now, Joel had finished making the dwegey and the sloli. 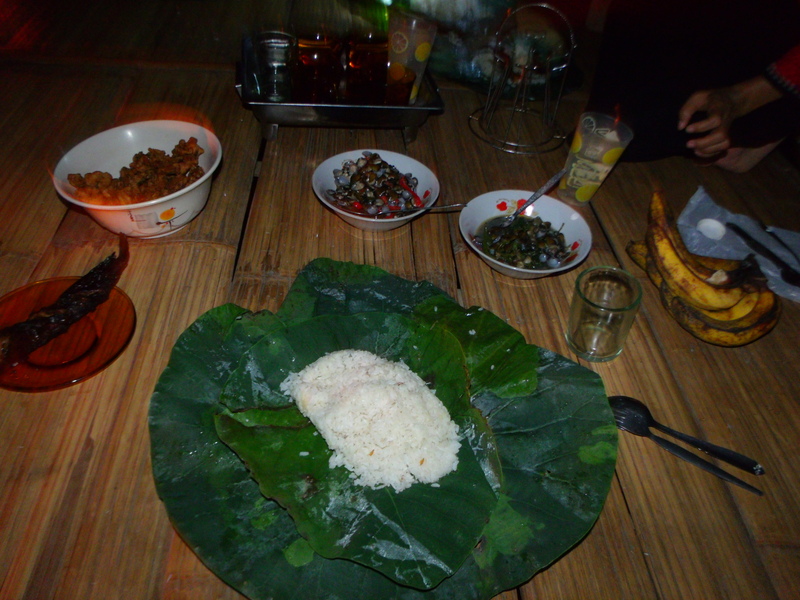 I would have to wait until my next visit for the t’nonggong as deer skin was unavailable. He did bring his own drum which he would play later. Oyog had wrapped some rice and the left-over fish we had for lunch in the leaves of the lemenge tree which she distributed to everyone. The dinner of clams which I had asked Green Box to cook for me was brought over together with the tilapia chicharon I ordered from the nearby eatery. We squatted on the floor with the food parcels before us and ate with our fingers. We washed it all down with orange juice. After clearing the dishes, the performance started. And boy, did I have a fantastic time watching them dance and play. Oyog annotated the performances and during the dances she would coach the three girls. 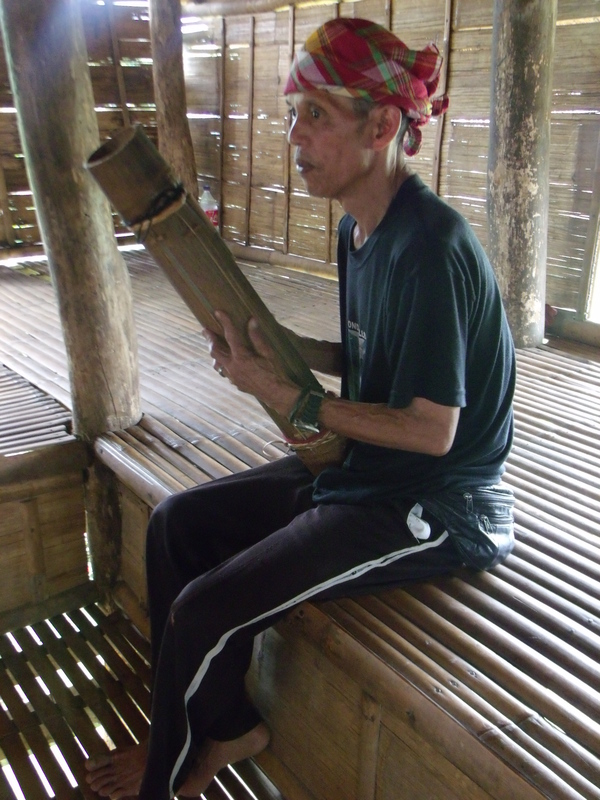 Joel was a true master musician who showed excellent playing of the t’nonggong . It was captivating to watch him coax vibrant sounds from such a small drum. One playing style consisted of him flinging his left hand in the air after a few strikes. At times, he would also touch the floor. His son had apparently also taken after him as the boy also played the drum very well. Accompanying Joel was Oyog on a flat slab of bamboo which had been attached to a small low wooden bench. This substituted for the floor. The special “instrument” had been made as a portable floor which could be brought anywhere there were performances, especially abroad. Madal tahu, one of the most difficult dances due to its fast rhythm was performed by Oyog who told me that whenever Joel plays the drum one can’t help but dance. It really was true. I felt so privileged to have been treated to such a performance. I could not thank Joel enough for his time and the instruments he had made for me. Shyly, he asked for just Php 200! I gave him double that as it was too low. I also gave him an advance of Php 500 to make me t’nonggong and a tambul. Deep in my heart, I knew he would not renege on his promise. It was past 10 when the performance ended. Joel packed his stuff and bade good bye as he had to walk back home there being no motos available. I stayed to just chat with Oyog but had to leave when her sister-in-law came by to say that her brother had been rushed to the hospital due to difficulty in breathing which didn’t seem to be such a big problem basing it on their conversation. At around 6 in the morning, with the mist still hovering over the hills surrounding the lake, Oyog and I made our way to the slew of huts we had visited earlier. It had rained in the wee hours of the morning so the trail was a little wet with a few slippery parts. Nobody stirred as we passed quiet huts. Only dogs came out to greet us with their barks. I hurried down the trail on the heels of Oyog as I didn’t want any dog following me around. As we turned a corner, up on a low hill, we espied the family of brass casters who were all up and at work on their little kiln. The molds had already been baked and they were just waiting for the melted metal to heat up at the right temperature before it could be poured. It was hot as smoke rose from the bonfire where the metal was heating-up to a fiery orange color. Finally, the man who had made my bell the previous day, using a long iron tong, lifted the container and poured it on the molds. I understood why they went to work so early in the morning. 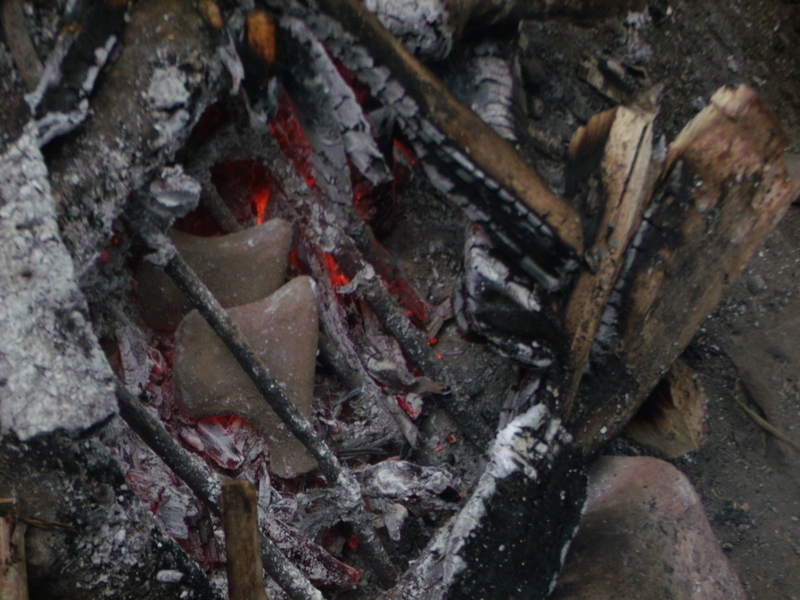 The smoldering heat of the kiln would have made work unbearably hot in the middle of the day. About fifteen minutes later, with the metal finally cooled and set, he broke the a flat mold apart revealing a shiny belt buckle. 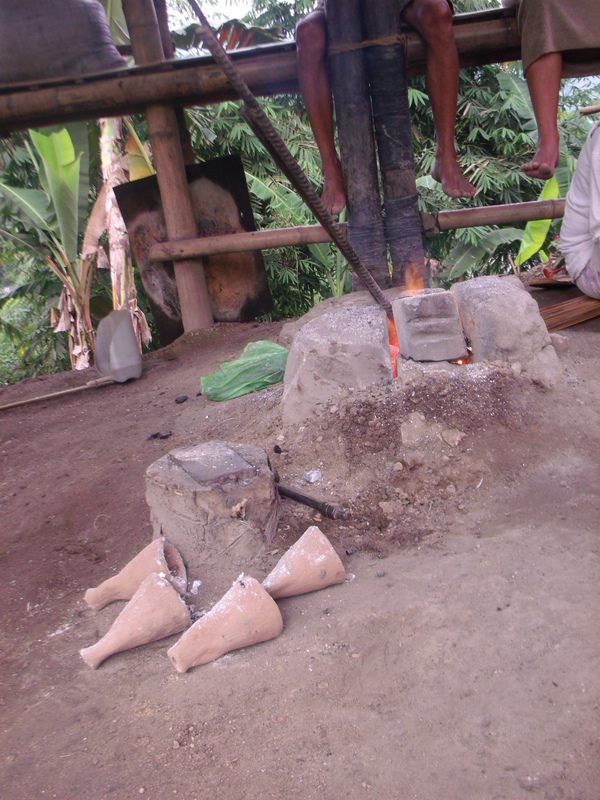 The rest of the molds were cone-shaped revealing beautiful bells with filigreed designs. They all glinted in the rays of the morning sun. In the meantime, the women chiseled newly minted little bells using small metal chisels which they pounded with to remove excess metal bits. Children milled around helping around. On the other side were a group of women who were also chiseling little bells. One of them brought out a basin of bells and said they had been ordered by somebody. It was so early in the morning and yet these people were hard at work already. Back at the Green Box, I slept a bit as there was still a bit of time for some shut-eye before heading to our next destination —- a village to visit a musician. I was really excited about this day as we were heading to the house of Ma Fil, a master musician who was going to make me some instruments. We hired a moto and a driver for the day (Php 500). The bike had none of the seat extension like what the other motos regularly used for commuting had so the three of us were squished together with me between Oyog and the driver. I was literally breathing down his neck especially downhill when we would all slide forward. I was quite worried that with all the weight forward the moto would topple. Core training was put to good use. The ride was on the main road that followed the ridge overlooking the lake. Parts of the lake that didn’t have any tilapia cages andresorts were quite pretty. Small souvenir stalls with woven baskets and beads hanging out front were picturesque. From the turn-off to the village, the road had become rocky but it was all very manageable. I understood why Oyog had wanted to hire a moto driver she knew as a lot of the motos were just wheezing pass us at almost breakneck speeds. An accident was the last thing we needed in this part of the world. Leaving the main road behind, we entered a world of green with verdant mountains and hills and undulating fields. We finally stopped at a small clearing where we parked the moto. We went up some steps carved onto the compact soil and up a small plateau where a large traditional T’boli house stood. The view was gorgeous as we could see the other side of the lake and fields as far as the eyes could see. A few kids were playing basketball on the small dusty field on the far right of which stood two small huts. 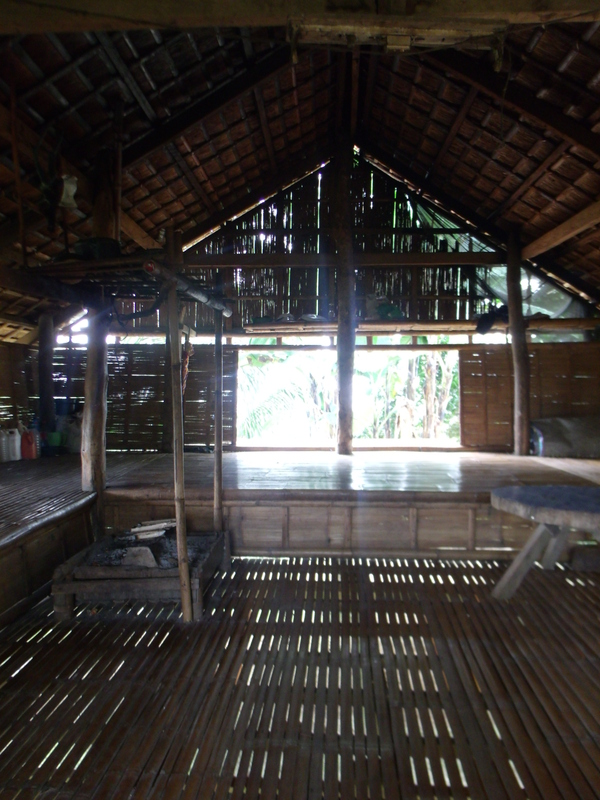 It was very cool and shady in the T’boli house. Solid logs held the house aloft which was accessed by a short flight of stairs. It was one big open space inside. The stove was on near the right corner of the house while on one corner right by the doorway were folded mattresses and blankets. Bamboo slats as flooring made everything very cool. Ma Fil, the owner of the house and my reason for coming soon arrived. Hanging on a beam above the stove was a sludoy, a 5-stringed bamboo zither. He took it and began playing. Soft sounds emanated from the instruments as his fingers deftly plucked the strips of bamboo that had been cut and raised to serve as strings. He played a few more pieces for me. 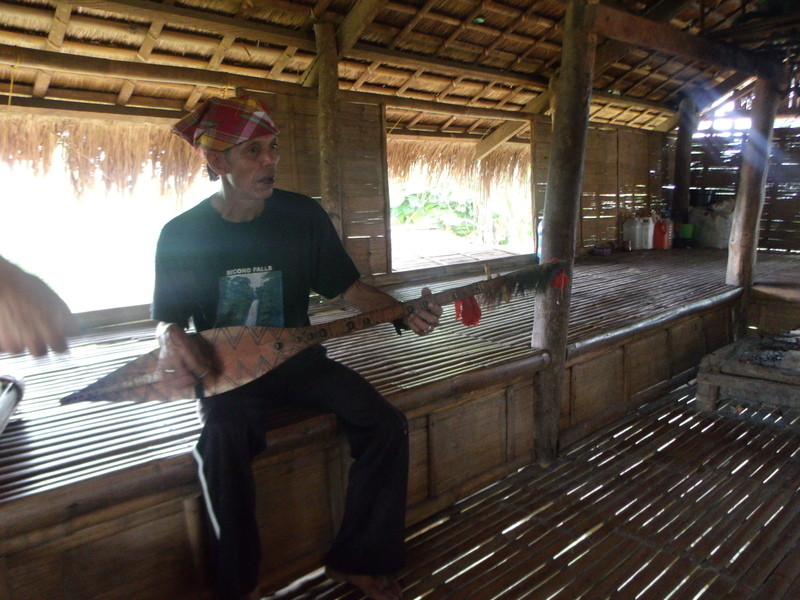 It was in the hegalong, the iconic T’boli 2-stringed lute that his mastery as a musician truly shined. Laying the instrument he himself had put together and designed, horizontally on his lap, his right pointer finger played the strings with a plectrum while the fingers of his left hand went up and down the neck of the lute on the frets. One piece imitated the sounds of a wood pecker. In this one, Oyog struckthe strings with a pair of very thin almost straw-like sticks which resulted in some sounds being damped. It was a really unique way of playing a lute, something I have not seen before. It was a magical moment sitting on the floors of the house as the sound of the hegalong embraced me. This is what I had come to Lake Sebu for. 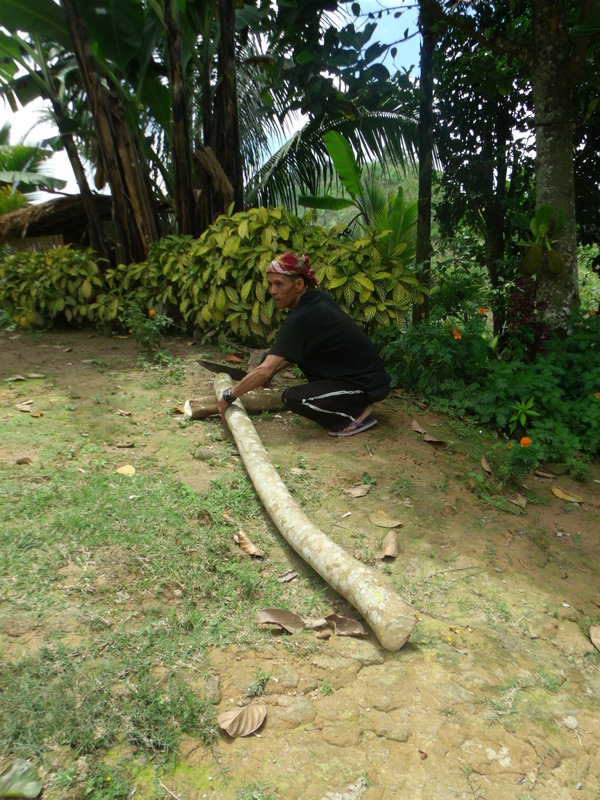 The performance ended and Ma Fil went off to get a node of bamboo to make a sludoy for me. I was willing to wait the whole day just to watch him make the instrument. A lot of people can play but few can make instruments and one of the signs of a master musician is his ability to craft instruments. I was going to seize this opportunity. 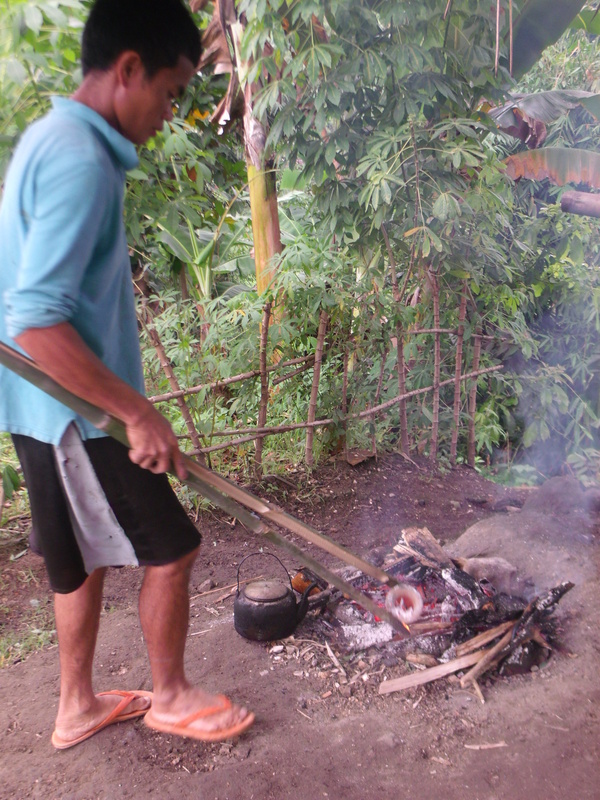 He returned with a newly-cut node of bamboo which he smoked on the stove to dry it out. 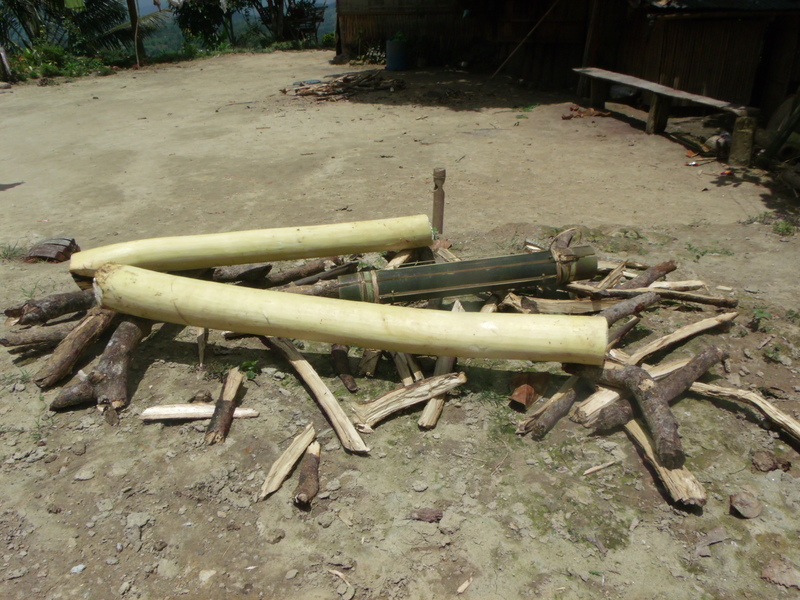 He put it out under the searing heat of the sun as he wove rattan strips to make a ring around both ends of the bamboo. Retrieving the now dried bamboo, he put the woven rattan ring and then with a sharp knife, carefully cut out strip of the skin which would be the strings. Small flat pieces of bamboo were wedged to raise the strings. A small hole was also cut out on both ends to allow the sound to resonate from the instrument. Ma Fil constantly shaved the strings until it was the desired thinness. He then returned the instruments to the stove to smoke it some more. Another round of plucking and listening to the strings. Apparently dissatisfied with one, he broke it and made another one. Testing the sludoy again, it became obvious it had passed his quality control when he finally started playing. By this time, the little boys he had sent out to bring a trunk of a lemenge tree had returned. Ma Fil then proceeded outside to cut and remove the bark from the wood until its pale white flesh showed. He cut shallow notches on both ends to which he tied black nylon strings he had found and taken from a used coal sack. The notch would prevent the string from sliding off the instrument when hanged and played. He was soon done and getting two bamboo poles, he stuck on them ground to which he hanged the log of wood. Taking two short sticks he had also cut from the one of the branches, he began playing. The klutang was done! While waiting for the klutangtod dry under the sun together with the sludoy , he still had enough energy left as he took a discarded piece of wood and started carving a mini hegalong for me. “Sample,” he told me with a grin. It was wonderful how he was able to carve out the graceful curves of the lute from the wood. It was way past lunch and we had not brought any food for us as we had not anticipated the long time we would be spending with Ma Fil. My stomach was grumbling but I wasn’t complaining. I was too much engrossed on what I had been watching, listening, and learning. I paid Ma Fil Php 500 for the sludoy and klutang he had made. It was a small price to pay for his efforts. 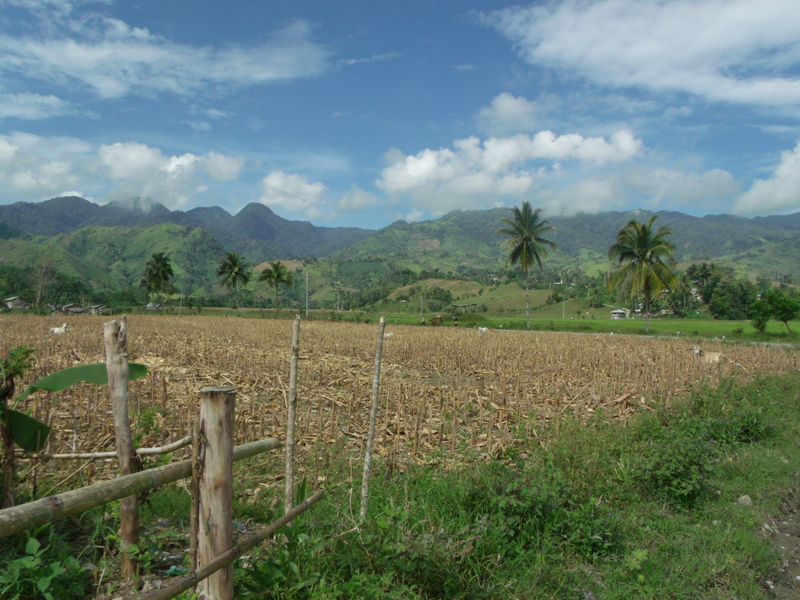 Oyog later told me that Ma Fil had been working in the fields to which he was being paid a measly Php 100 per day! His son had told him to hurry-up with what he was doing as he needed to return to his work in the fields. 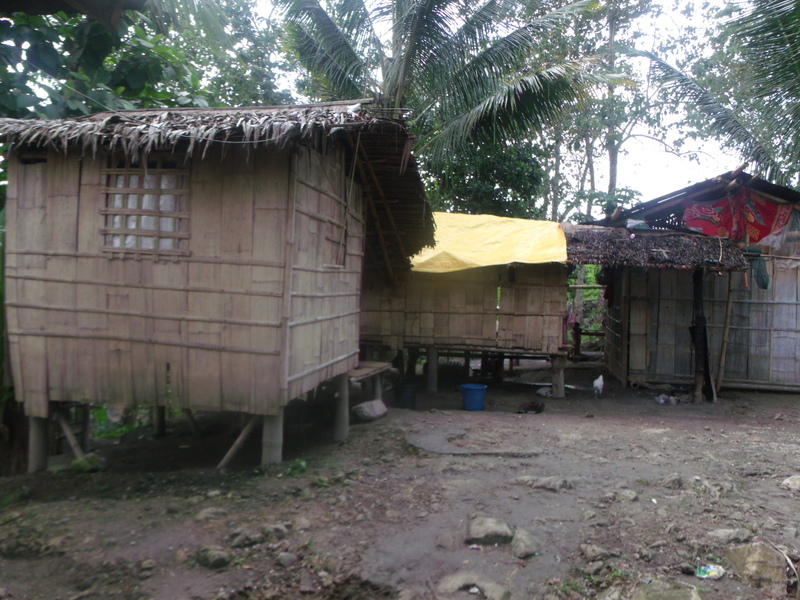 Php 100 matters a lot to a family with no other source of income to feed them. But Ma Fil had told his son that he had to finish making the instrument as I might want to buy it. I think instrument-makers like him should be encouraged to make instruments to keep his craft going. As the tourist market gets flooded with imitation instruments that look good as display pieces only, real music instruments from real makers should be patronized. He used to play at Punta Isla before but being paid only Php 150 per day with no meals and no transpo allowance, he has since stopped as it wasn’t enough. I was shocked to hear this as the resort could have at least given him free meals. Transpo to and from his place to the Poblacion costs Php 80 per day already, so what would be left wouldn’t even be enough to buy a kilo of rice. We only brought the sludoy back with us as it was impossible to bring the klutang. I just gave Ma Fil 50 bucks to get a moto and bring it to the Green Box. 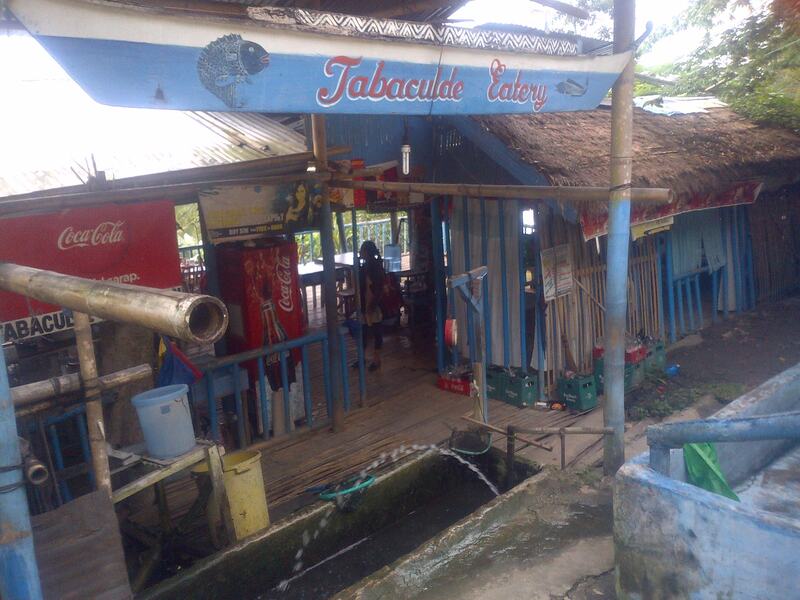 We motored back to the main road and went to one of the roadside eateries for a lunch of what else…. 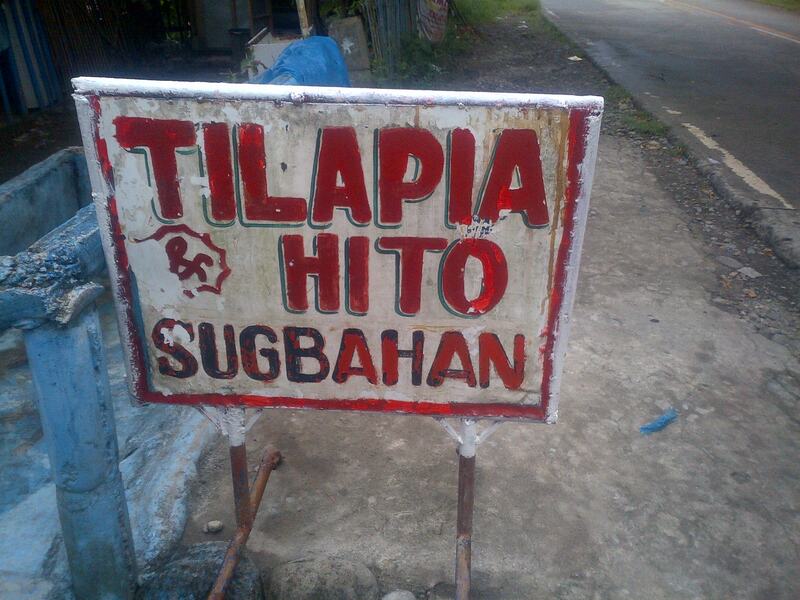 tilapia! The chicharon tilapia was very good but even better was the lagpang. It was charcoal-roasted tilapia that had been cooked in a sourish soup. It was tasty and good. Next stop was Lang Dulay, the dream weaver. 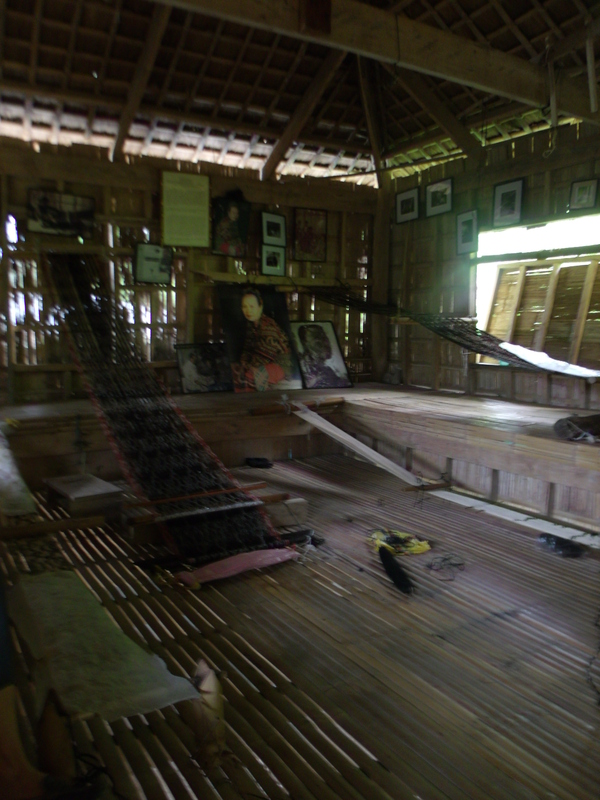 Located in a small village past the area where the recent cyclone wreaked havoc, we reached the small school established by National Living Treasure, Lang Dulay, where she teaches the younger generation the ancient art of t’nalak weaving. I first came across Lang Dulay in the Dreamweavers video and I have since been fascinated with her and her craft. Unfortunately, I had come at the wrong time. It was a weekend and the school was closed and the grand old lady, now in her 80s and no longer weaving, was in Poblacion. We went up and took a look around the school was just a wide area in the stilted house where t’nalak was i the various staged of weaving. Soon, some of her students arrived. They were all very nice and answered all my questions. Apparently, due to her age, Lang Dulay, fondly referred to by her students as “Lola” no longer weaves. She still teaches, though, and at present has 16 active students, all female as it is taboo for men to weave t’nalak. The women are all involved in the process of making the cloth from the dyeing to the knotting and the weaving. They say that the weaving is actually not very difficult. It is the process of dyeing the threads and tying the knots that take a lot of time. All the designs are done by Lang Dulay as she is the only one who knows up to a hundred designs, all coming from her dreams as the T’boli believe that the designs of this precious and almost sacred cloth must come from dreams. Lang Dulay starts the initial knots for the first set of designs which are then continued by the students. For an entire bolt of t’nalak that had been personally tied by Lang Dulay herself from top to bottom, the cost would be Php 1,500/meter. The actual weaving is done by one of her students though. A bolt of cloth done by one of the students is priced much lower from Php 600-700/meter depending on the design. Unlike the cheaper ones at Php 350/meter sold at the souvenir shops, those from the school of Lang Dulay only uses natural dyes which means a more permanent coloring and the designs are truly beautiful. Only the traditional colors of red, brown, and natural are also only used. Those knotted by Lang Dulay bear her signature woven at the end of the bolt. 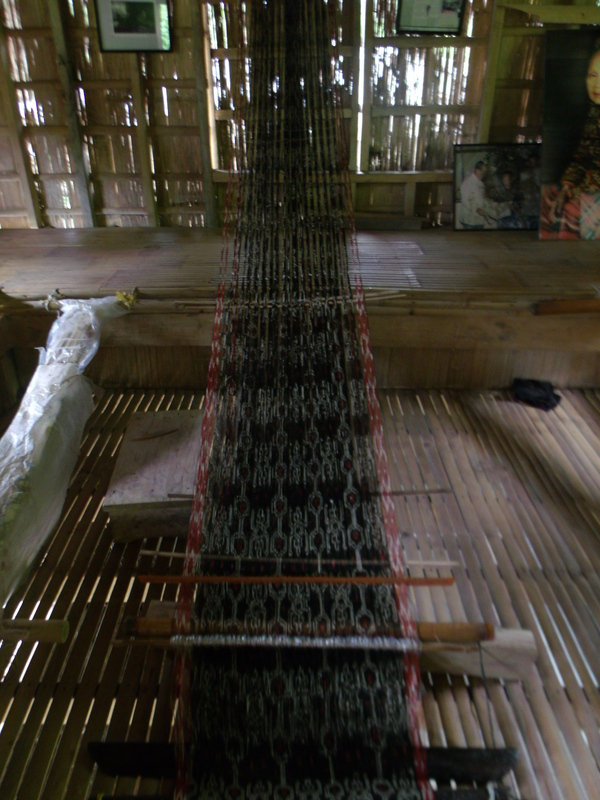 Also, it is only Lang Dulay who makes cloth with as much as four different designs in a single bolt. I could only afford a 2.5 meter bolt woven by one of her students. It was a keepsake well worth the price. Storm clouds had again gathered and we made a quick exit to beat the rain. We arrived back at the Green Box just as the clouds let loose with a torrent of rain. 1. 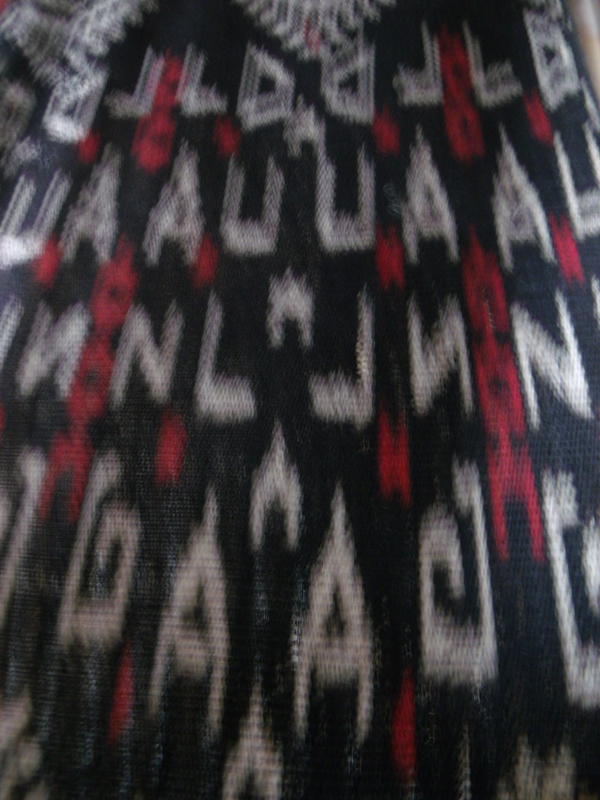 T’nalak cloth is generally sold in bolts of 5 meters unless they were made in bolts lesser than that such as 2.5 meters. Because of the designs, you cannot simply ask them to cut. The bolts would have a “blank” edge between the designs to signify the end of one entire bolt measuring for example, 5 meters. It is only at those “blanks” that the cloth could be cut. 2. Bring cash of course. Don’t expect to pay with a card. 3. You can order a bolt and have them sent via LBC to you. 4. The school is open Monday to Friday only. But the people are nice enough to open it and talk to you if you wanna look around. At the very least, buy some cloth for their effort.